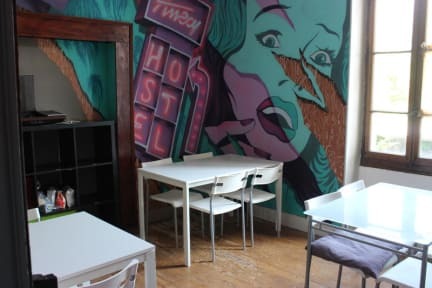 Decent hostel overall. There are 2 buildings, Annecy hostel & Annecy pink hostel, but you check in at the same place. If you have the pink hostel yours will be the second building about a 2 minute walk from reception. There is no Wi-Fi in the dorm rooms in the pink hostel and there is no hot water in the shower. The layout was nice. A kitchen, dining room, and some couches. The kitchen could have been a lot cleaner! Theres a bar/restaurant on site. 15 minute walk to the old town. Large hostel, small bathrooms and loud atmosphere. Bathrooms were not the cleanest or most spacious. Took half an hour to check in as well. Not the most accessible hostel, was very hot at night and no AC so it was very uncomfortable. Hostel location was below average, outside the heart of Annecy and pretty far from the waterfront. Probably wouldn't stay here again. This hostel is FILTHY!! No sockets near beds, no locks on rooms, anybody from the street could come and rob you in your sleep!! The spanish guy working the reception was nice. Showers were too disgusting to shower in, and just one WC for the entire hostel!! ABSOLUTELY DO NOT STAY HERE! !